MacKenzie Contracting, LLC is pleased to announce the completion of the 1,562 sf Starbucks coffee shop at 6900 York Road, situated at the intersection of York Road and Regester Avenue in the Rodgers Forge community. This new Starbucks and drive-thru replaced a bank and office building which were demolished earlier this year. The scope of work included the construction of a complete new structure with a drive-thru from the ground up on a pad ready site. The main feature of the building is the Charred Accoya exterior siding, a sustainable wood product that is non-toxic, fully recyclable, and acts as a natural insulator and insect repellent. The unique interior includes custom hand painted artwork which is a credit to the Starbucks creative designers. About a half-mile south on York Road, an existing Starbucks has permanently closed in anticipation of the new store’s grand opening which was held last weekend. The ribbon cutting on October 2nd was attended by members of the local community, law enforcement officers, Starbucks personnel, Mark Renbaum, MLR Partners who developed the site, and members of the MacKenzie team. “We are thrilled to partner with Starbucks once again on this beautiful store, it will be a great addition to the community,” said Joe Versey, Senior Vice President of Business Development with MacKenzie Contracting. “Working with MLR Partners was a pleasure and we always enjoy and appreciate being involved in a local community project,” added Versey. 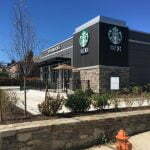 This project represents just one of many Starbucks MacKenzie Contracting has completed in the Baltimore Metropolitan area and they currently have additional Starbucks projects in their pipeline. For more information on this project, please contact Joe Versey at 443-610-7505 or jversey@mackenziecontracting.com. For information on the offerings of MacKenzie Contracting Company, LLC, please visit www.mackenziecontracting.com.